We're offering savings on websites, content marketing, and social media marketing for staffing and recruiting. Learn the process for engaging and aligning with technical executives and corporate buyers in addressing their most pressing critical business issue. The keynote speakers at Staffing World shared fresh insights and best practices that are shaping today's staffing industry. And today, we want to share them with you! For a full recap of the entire conference from our six Haley Marketing attendees, check out the video below. 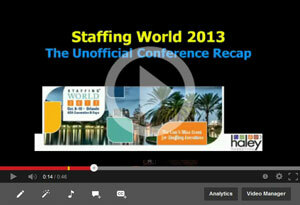 It's the archive of our Staffing World 2013 Recap webinar. 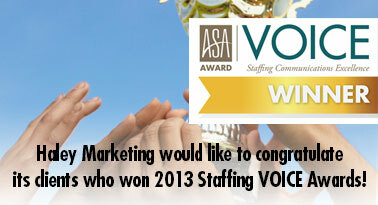 The slideshow below showcases Haley Marketing's clients who won 2013 Staffing VOICE awards. Congrats to all the winners! Google Hummingbird - Absolute Disaster or New Hope? Happy Halloween! I hope you enjoy all the treats in this issue of the Idea Club! Speaking of treats, Haley Marketing is offering our ACA, the Affordable CREATIVE Act, with savings on websites, content marketing, and social media marketing for the staffing industry. Click here to request a quote on these services.